2012 is almost over, and if you’re like me, you’re looking forward to a promising 2013. Yes, it’s merely a change in the calendar, but rolling over to a new year does give one occasion to pause and think about what we should be doing right now to prepare our small creative businesses for a more fruitful year. Your profit and loss statement (P&L, for short) is the statement that gives you a rundown of your costs for the year and puts them up against your revenues to show you if you are ending the year in the red or in the black. (If you don’t know what a P&L statement is or don’t know how to run one, ask your accountant). One thing that your P&L statement will tell you is how much profit, if any, your company has made over the last 12 months. So if you have made a profit, give yourself a pat on the back and then ask your accountant what kind of tax hit you should prepare for. If you haven’t, identify those areas where you need to generate more revenues (or reduce expenses) and set those plans in motion for 2013. You can potentially lower your income taxes for this year by identifying when to make payments or create revenues or income. For example, by prepaying things like rent / mortgage, office supplies, association fees, business software, insurance premiums and loans, you could potentially lower your taxes this year. In addition, you could decide to make other tax-deductible payments now or choose to defer revenue until next year. Consult your accountant for guidance. It’s never too early to get your ducks in a row when it comes to upcoming projects. December is often the time when many companies finalize their 2013 budgets, and if you’re run a business in graphic design, web design, photography, public relations or marketing, you may want to find out from your clients where they have set their marketing budgets and what projects and initiatives they have identified for 2013. And if you’ve already scheduled projects with clients for 2013, now is a good time to follow up on those just to confirm when they will be starting. There’s nothing worse than expecting revenues from a project only to find out later that the project has been delayed or even canned. 4. Identify your most profitable business practice in 2012 and replicate it (if possible). Sometimes we get so busy in our lives and professions that we don’t reflect on our past successes. Moreover, we sometimes get busy and stray away from the strategies and tactics taht were effective in growing our business. I’m as guilty of this as the next business owner, so I encourage you to reflect on what worked for you in the past year and determine how you can weave these approaches and tactics into your business next year. 5. Identify one marketing/sales tactic you haven’t used and try it next year. The business that comes to a standstill is the one that stops growing, and the only way you can grow is to continue to try new and different things, discarding those things that fail and tweaking those that show promise. So if you haven’t yet dived into the world of social media, 2013 is the time to dip a toe in. If you haven’t yet established a reliable referral channel, now is the time to solidify those relationships with peers and vendors. If you haven’t streamlined your business operations and automated a number of your internal processes, now is the time to seek out those tools and software apps to help you do so. P.S. One final tip … If you’re going to offer up holiday greetings, do it in a personal way. Too many businesses send out boilerplate greetings (generic cards, emails, etc. ), a seemingly obligatory act that is almost as quickly ignored as it was conceived. Instead, try to do something personal with your holiday greetings. Even a phone call to each of your clients telling them “happy holidays” and that you appreciate their business is more memorable and appropriate. 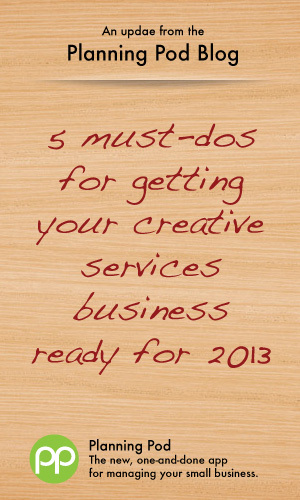 What one thing could you do for your graphic design, web design, photography or creative business to be more productive in 2013? Try Planning Pod for free and see how our online app for creative services firms can make you more efficient and impress your clients.